Namtok Thi Lo Su is located in the Umphang Wildlife Sanctuary, a UNESCO World Heritage site, which links with the Thung Yai Naresuan and Huay Kha Kaeng Reserves, as well as Khlong Lan and Mae Wong National Parks. Together, they form Thailand’s largest wildlife haven and Southeast Asia’s top virgin forest. 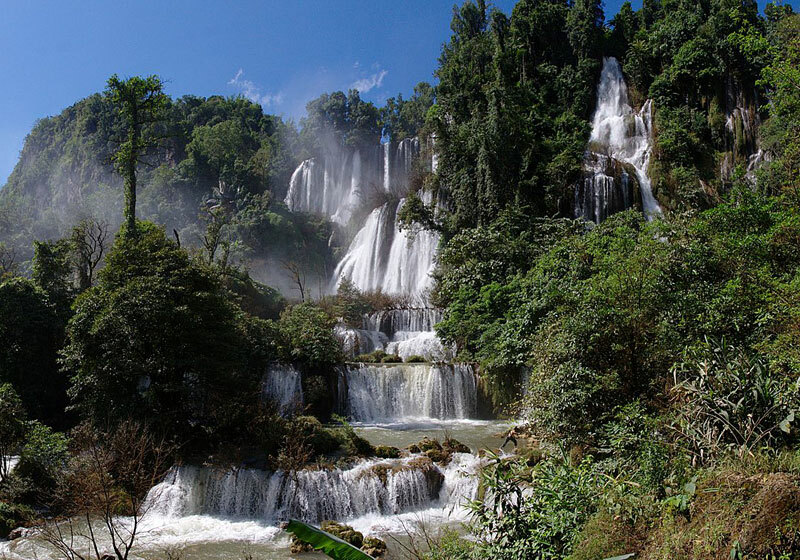 The Umphang forest Wildlife Preservation Office, Amphoe Umphang , Tak province will close the road from the Huai Nong Luang forest Protection Unit to Thi Lo Su Waterfall, a distance of 25 kilometres, as of 1 June – 30 November of this year, which is also the monsoon season. Travel in the area during this period is very difficult, and it also allows the forest to recover and for wildlife to search for food and breed. Short Description: The Thi Lo Su Waterfall is claimed to be the largest and highest waterfall in Thailand. It stands 250 metres (820 ft) high and nearly 450 metres (1,480 ft) wide on the Mae Klong River, flowing down from Huai Klotho into the Umphang Wildlife Sanctuary in Tak Province in northwestern Thailand.